Michael Berrington is a bachelor leading a quiet life in London. Overhearing a conversation at his club one day, he becomes interested in a discussion regarding a man named Gastrell. Gastrell is somewhat of a mystery to the club members in spite of his renting a house from one of them. Berrington’s interest in Gastrell intensifies as his fiancé, Dulcie Challoner, befriends a wealthy widow, Mrs. Connie Stapleton who evidently has some type of relationship with Gastrell. As the plot progresses, Berrington finds himself involved with sensational robberies, brutal murders, coded messages, and even mind control! 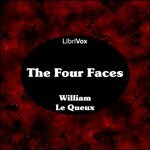 As in many Le Queux books, there are twists and turns as new characters and locations are introduced. When you are sure you know the ending, something new occurs and you wonder how it will affect the conclusion of the book.